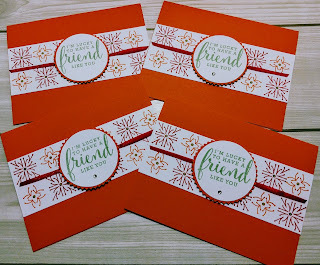 Renee's Paper Treasures: Thursday Treasure: Stampin' Up! 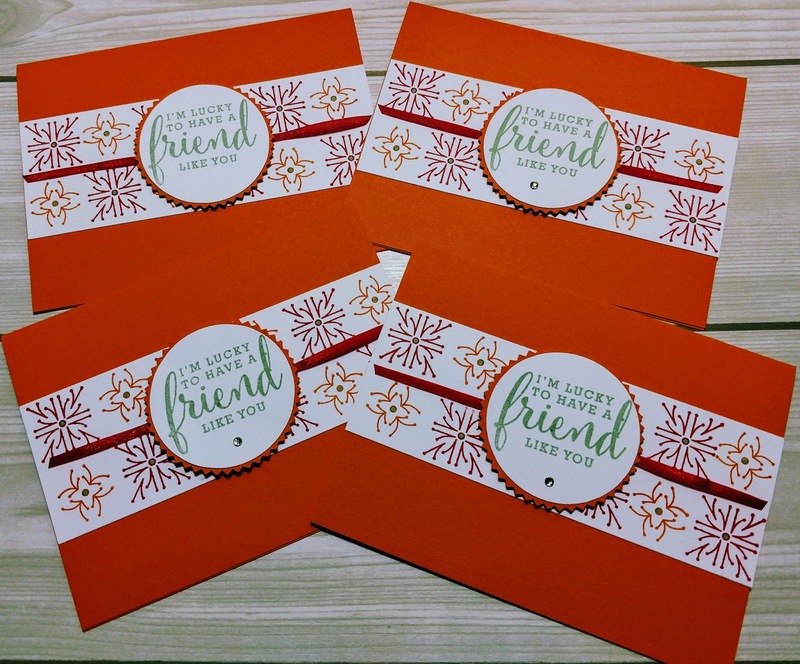 "Around the Corner"
Thursday Treasure: Stampin' Up! "Around the Corner"
I participated in an organized swap for the new catalog. The swap challenge was to create 20 full cards using a new stamp set. I decided to feature the "Around the Corner" stamp set. The images on this set are so cute. I decided that I wanted to use the One Sheet Wonder technique as my inspiration; however, this stamp set don't have a coordinating designer series paper. So thinking outside the box I created my own custom designer series paper (DSP). I wanted my color to bright and festive, so I chose Pumpkin Pie, Real Red, Mint Macaron and Whisper White. 1. Cut Pumpkin Pie Card stock 8 1/2" x 5 1/2", score @4 1/4"
6. Using the star images in the Around the Corner Stamp set create the custom designer series paper (DSP). 7. Stamp sentiment on 2" circle shape using the Love What you Do stamp set. 8. Attach circle shape to starburst shape using snail adhesive. 9. Attach the dsp piece to the card base using the snail adhesive. 10. Add ribbon on top using mini glue dots. 11. Add sentiment layer over ribbon using dimensionals. 12. Add rhinestone to sentiment layer for extra embellishment. If you are new to stamping or don’t already have a designated demonstrator… I would love the opportunity to earn your business. Complete the "contact me form" in the right hand corner and I’ll send you a catalog right away!